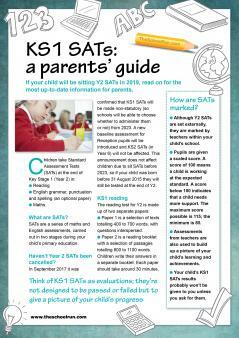 New-style KS1 SATs were introduced in 2016 for all Year 2 children in England. Here's what parents need to know about the English and maths assessments in 2019 and beyond. On 14 September 2017 it was confirmed that the KS1 SATs will be made non-statutory (so schools will be able to choose whether to adminster them or not) from 2023. Until then children will continue to be assessed in May during Year 2. In 2017 the KS1 SPAG test remained optional, so schools could choose whether to adminster it to their pupils. This was also the case in 2018. 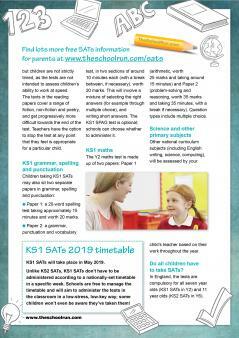 Unlike KS2 SATs, KS1 SATs don't have to be administered according to a nationally-set timetable in a specific week. Schools are free to manage the timetable and will aim to administer the tests in the classroom in a low-stress, low-key way; some children won't even be aware they've taken them! Children are given a scaled score. Their raw score – the actual number of marks they get – is translated into a scaled score, where a score of 100 means the child is working at the expected standard. Teacher assessments are also used to build up a picture of your child’s learning and achievements. In addition, your child will receive an overall result saying whether they have achieved the required standard in the tests (your child's actual results won't be communicated to you unless you ask for them). 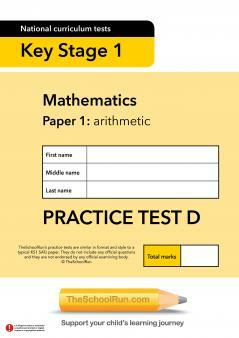 Are there any practice papers for KS1 SATs? 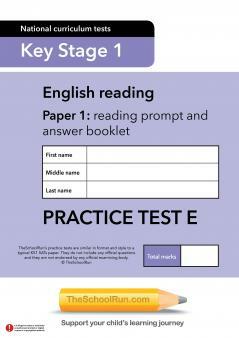 Our two-page guide to SATs in Year 2 gives you all the information you need to support your child. Click on the image below to download it.